Definition at line 2043 of file lscript_tree.h. Definition at line 2046 of file lscript_tree.h. Definition at line 2051 of file lscript_tree.h. Definition at line 8384 of file lscript_tree.cpp. 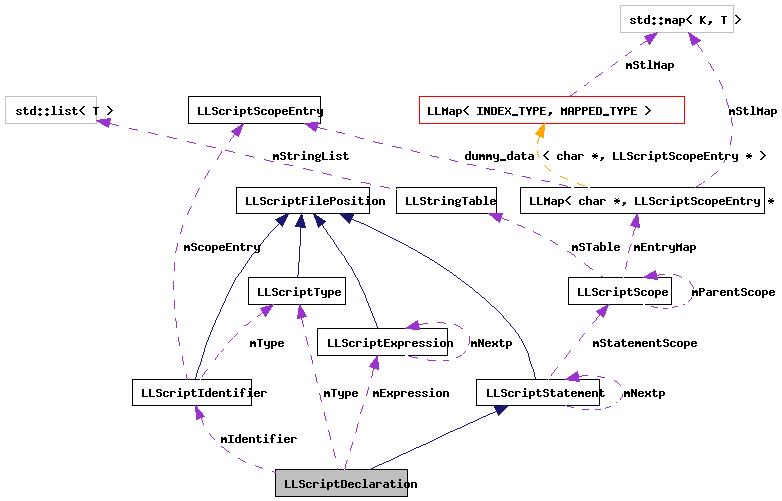 Definition at line 8389 of file lscript_tree.cpp. References LLScriptByteCodeChunk::addByte(), LLScriptByteCodeChunk::addBytes(), LLScriptScope::addEntry(), LLScriptByteCodeChunk::addFloat(), LLScriptByteCodeChunk::addInteger(), LLScriptArgString::addType(), cast2stack(), LLScriptScope::checkEntry(), FALSE, LLScriptFilePosition::fdotabs(), gErrorToText, LLScriptGenerateErrorText::getErrors(), LLScriptArgString::getNumber(), LLScriptType::getSize(), LLScriptStatement::gonext(), is_parameter(), legal_assignment(), LIT_GLOBAL, LIT_VARIABLE, LOPC_LOADLP, LOPC_LOADP, LOPC_LOADQP, LOPC_LOADSP, LOPC_LOADVP, LOPC_PUSHARGI, LOPC_PUSHARGQ, LOPC_PUSHARGS, LOPC_PUSHARGV, LOPC_STACKTOL, LSCP_EMIT_ASSEMBLY, LSCP_EMIT_BYTE_CODE, LSCP_EMIT_CIL_ASSEMBLY, LSCP_PRETTY_PRINT, LSCP_PRUNE, LSCP_RESOURCE, LSCP_SCOPE_PASS1, LSCP_TO_STACK, LSCP_TYPE, LSCRIPTOpCodes, LSCRIPTTypeLocalDeclaration, LSERROR_DUPLICATE_NAME, LSERROR_NEED_NEW_SCOPE, LSERROR_TYPE_MISMATCH, LSERROR_UNDEFINED_NAME, LSPRUNE_DEAD_CODE, LST_FLOATINGPOINT, LST_INTEGER, LST_KEY, LST_LIST, LST_QUATERNION, LST_STRING, LST_VECTOR, LLScriptStatement::mAllowDeclarations, LLScriptScopeEntry::mCount, mExpression, mIdentifier, LLScriptScopeEntry::mIDType, LLScriptScopeEntry::mLocals, LLScriptIdentifier::mName, LLScriptScopeEntry::mOffset, LLScriptIdentifier::mScopeEntry, LLScriptScopeEntry::mSize, LLScriptType::mType, LLScriptScopeEntry::mType, mType, NULL, LLScriptIdentifier::recurse(), LLScriptType::recurse(), S32, TRUE, and LLScriptGenerateErrorText::writeError(). Definition at line 2060 of file lscript_tree.h. Definition at line 2059 of file lscript_tree.h. Definition at line 2058 of file lscript_tree.h.